Mingl • Here. Now. Launching in Chicago March 2014. Whether you're looking for a casual meetup, a potential relationship, or even to join groups, Mingl finds others nearby looking for the same thing. Sign up for beta to get early access! 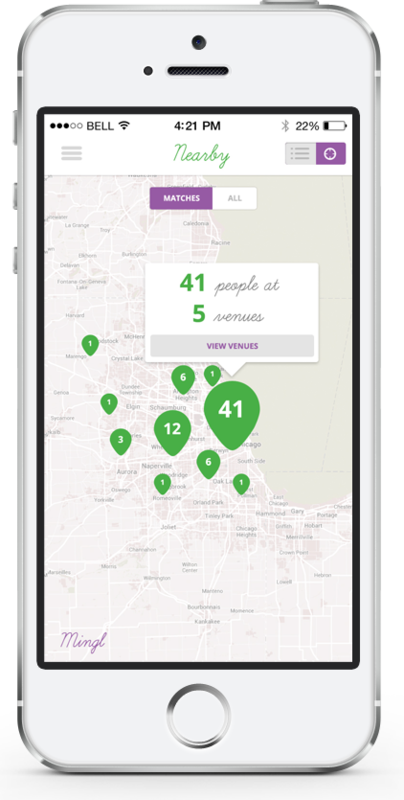 View singles at the same venue that match what you're looking for. View user profiles before making an intro or accepting a Mingl request. Did your introduction go well? Do you want to meet up with them again? We’ll use this to make your experiences better. Tired of traditional Online Dating? Take our survey and get 2 FREE Mingls! © 2014-2015 Steady App. All Rights Reserved.